We believe that families have the God-given right to raise their children, and THSC has been serving homeschool families for over 30 years. Learn how a membership can benefit you and your family and help us continue Keeping Texas Families Free! Become Familiar with the Law. Understand what is—and what isn’t—legally required for your home school. These videos will answer many of your questions and help you start off on the right foot. Find a Local Home School Group. Connections with other home schoolers provide important information, ideas, activities, and many times much-needed advice and encouragement. Learn about the many options, and narrow down the best curriculum fit for your family. Learn how to avoid legal problems when disenrolling your children from the public school system. A few final thoughts before you begin your journey. Home schooling your children can be one of the greatest things you ever do for them and for yourself. Enjoy! As a coalition impacting over 100,000 Texas home school families and with a staff and volunteer network of hundreds all with home schooling experience in Texas, THSC connects and provides your family with an invaluable wealth of information and support. THSC exists as the local authority on home education in Texas. In fact, the Texas Education Agency (TEA) often refers calls on issues of home schooling to THSC for verification or resolution. As the state authority on home schooling, you can depend on us to support your rights as a Texas family. Join THSC and actively fight with us to protect families and parental rights. We appreciate what you do and will continue to support THSC even after our youngest graduates soon. God bless you! We’re done [home schooling] with our 4 boys. I truly appreciate having this resource all these years. Grateful I never needed litigation! Thank you for all you do — defend, teach, encourage, etc. Since 1986, THSC has been serving and informing parents and the home school community in Texas and we continue to serve you in Keeping Texas Families Free. Will you join the Coalition today? Home education is clearly legal! 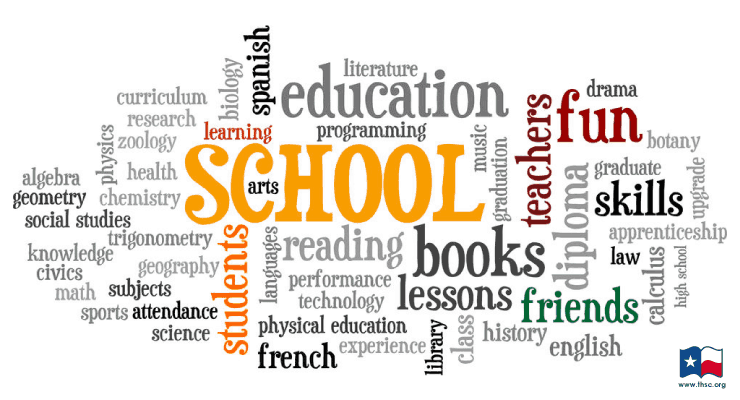 The curriculum must include the basic subjects of reading, spelling, grammar, mathematics, and good citizenship. You may also send your children into the home of another parent or use a tutor for instruction. The courts have determined that Texas home schools are private schools for the purpose of compulsory attendance. As such, home schools are not regulated, do not require teacher certification or third-party curriculum approval, and they are exempt from compulsory attendance laws. For more information on home schooling and the law, see State Requirements. How did home schooling become legal? The fact that home schooling is legal is based on the decision of the Leeper vs. Arlington ISD class action suit (Case No. 17-88761-85). Home school law in Texas is case law, binding on all 1,100 Texas school districts. That April 13, 1987, decision was a complete vindication of the right of Texas parents to educate their children at home. For a more complete history, see The History of Home Education in Texas. Home schooling experts and veterans share important information and experiences to teach, encourage, and answer some of the many questions you may have. Part 1 – Is it Legal? THSC President Tim Lambert explains the legality of home schooling, how to disenroll your child from public school, and more. Learn more about specific Legal Problem Situations . Former THSC Director of Publications Lyndsay Lambert covers the topics of structure, discipline, curricula, and learning styles. Lyndsay also covers subjects to teach, scheduling, lesson plans, record keeping, support group participation, and dealing with discouragement, and the “do nots” of home schooling. Former THSC board member Chris Parrish explains how a father can make a difference and be part of the team. Beverly Parrish discusses the encouraging benefits of support group membership and how to find a group near you. THSC board member Sarah Singleton discusses the plethora of extracurricular activities available. Mary James talks about “Smoothing the Way” groups and resources. THSC Special Needs department team lead, Peggy Ployhar, talks about extra considerations parents should take when home schooling a special needs student. Home school groups are formed when home school families come together to meet the needs of the families involved in their group. There are many types of home school groups, providing fellowship, activities, co-op classes, support for moms and dads, family events, and more. Activities such as field trips, sporting events, play groups, etc. By Texas state law, home school parents are responsible for choosing and pursuing in a bona fide manner a curriculum that covers the basics of reading, spelling, grammar, mathematics, and good citizenship. There are many different types of curriculum to meet the needs of your family and individual students. THSC does not endorse specific curriculum providers or types of curriculum. This curriculum is referred to as parent-taught curriculum. The parent is responsible to pursue the curriculum in a bona fide manner. THSC recommends keeping a record of work completed. Please be aware that curriculum is not “accredited.” Schools and programs can be accredited. To be accredited, a school must meet certain standards such as holding classes the same number of days and hours as required of public schools, employing certified teachers, etc. There are accredited correspondence schools in which the student can enroll. In these cases, teachers from the schools give the assignments and grade the work. These programs tend to be more expensive, because the school is doing more of the work. Enrollment in an accredited school is not legally necessary to home school. Most home school curriculum is ordered by the parent educator from the publisher or online provider. Publishers/online providers usually have a website with contact and pricing information. There is no state funding for parent-taught home school curriculum. All expenses are the responsibility of the parent. Parents may choose to mix and match from different curriculum providers to provide curriculum for the five basics of education. For example, a family can choose an online provider for math and good citizenship while choosing a traditional textbook/workbook provider for reading, grammar, and spelling. Mardel and Rainbow Resource Center carry home school curriculum for purchase. 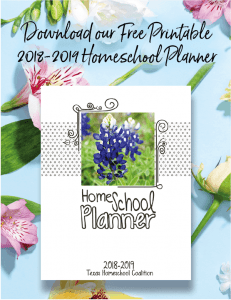 HEP Bookstore in Houston, The Homeschool Store in Houston, and Home Educator’s Resource in Lewisville (Dallas area) are great resources for those that live in those regions of Texas. You are not legally required to register with your local school district or receive their permission to homeschool, but you must withdraw your child(ren) from public school if they are already enrolled. Note: The date that you will begin homeschooling is now required by the Texas Education Agency (TEA) in order to withdraw a child from public school. It is important to make certain that students are withdrawn before homeschooling begins and that homeschooling begins as soon as the student is withdrawn in order to avoid schools counting the student absent prior to withdrawal and potentially filing truancy charges. Send a withdrawal email to the principal, counselor and attendance clerk of the school (and to anyone else from the school with whom you have had contact) and send a copy of the email to disenroll@thsc.org. Email the letter one day, then keep your child home the next day and begin homeschooling. If you are already in contact with a local homeschool support group, email a copy of the letter to the leader(s) of the group. Note: In some cases, school districts have not opened certified letters, and they have been returned unopened to sender. Write a withdrawal letter to the principal of the school, explaining that you will be teaching your child(ren) at home. Print three or four copies. Print the Commissioner of Education’s letter and include it in the envelope with the withdrawal letter. Mail a signed copy of the letter and request a Certified Mail Receipt in order to receive and retain proof of delivery. Keep the second copy of the withdrawal letter and the post office receipts for your records in order to document your correspondence. Mail the letter one day, then keep your child home the next day and begin homeschooling. Send the third copy of the letter to us (THSC, P.O. Box 6747, Lubbock, TX 79493). If you are already in contact with a local homeschool support group, mail the fourth copy to the leader(s) of the group. If the school subsequently contacts you and says you must do more (e.g., come to the school office, fill out a form), do not go to the school. Instead, respond by email or mail with a letter of assurance. The TEA has instructed school districts that such letters meet the guidelines of cooperation in compliance with compulsory attendance laws. If you have read and followed the previous 6 steps, you should be prepared to home school. Now all you have to do is begin. Enjoy your students and the opportunity to home school. Be flexible. If something is not working, be willing to try something new. Keep realistic expectations. Comparison to the public school system or other home schoolers will leave you frustrated. Set educational goals that fit the needs of your children. Know you are not alone. Staying connected with other home schoolers will provide information, support, and encouragement during difficult times. Read other helpful articles for New Home Schoolers.